Kitchen Faucet Options – What Makes Sense? Believe me when I tell you that it’s easy to get ahead of yourself when you’re looking for something new to add to your home, especially when it comes to fixtures and fittings. I have had a good number of customers over the years that came to me with an idea of what type of kitchen faucet they wanted, only to find that once it was installed it just didn’t make sense in the general surroundings. So, before you get all excited about some of the reviews I have here for you I would like to try and help you keep your feet on the ground. The very last thing I want is for you to be dazzled by a stunning finish or particular feature and then be disappointed because the faucet you’ve chosen just doesn’t make sense in your kitchen. This is the first thing I would like you to think about. How many features do you really need? For instance, if you have a busy kitchen that’s always in use then it might be a good idea for you to have a faucet that has lots of additional features that make life easier. Let me give you some examples. Some of the faucets I have here will allow you to pause the flow of water while you work at your sink. This is great if do a lot of filling of pots, pans and other vessels away from your sink. However, if you tend to do this in your sink, a pausing feature might be something that’s rarely used. The same applies when you’re deciding if a pull out or pull down kitchen faucet will suit your needs best. Pull out designs are much better for those of you that need more flexibility with the spray head whereas pull down designs are better if you just want to be able to easily rinse vegetables, dishes or clean your sink. At the very top end of the price range in the reviews I have, you will find kitchen faucets that use MotionSense or “touchless” technology. These are great if you cook a lot and your hands need washing often. They’re also a very good way of keeping your kitchen more hygienic so this might be something to consider if you have children coming in for a glass of water on occasion (no nasty germs on the faucet). However, if you’re the sort of person that doesn’t cook much, having a feature like this will probably be more for effect than functionality. I’m not about to start telling you how to choose the right color, but what I will tell you is that you should think about the overall layout of your faucet. There are so many to choose from it can easily become confusing. Again, let’s take some examples. If you want the option of a spray, you can choose from an integrated design (as mentioned above) or you can have a side spray design. But, remember that a side spray isn’t as flexible as say a pull out type faucet. Plus, you have to remember that you will need an additional hole for installation. The overall finish (aside from color) is something else. 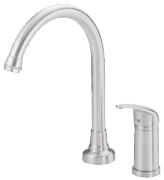 Do you need a faucet that’s resistant to water spots and fingerprints? Have you thought about the ergonomics involved with the design? Some levers that come with the faucets I’ve reviewed here look very nice, but if you have trouble flexing your fingers it’s worth taking into consideration how easy the handle will be to use. There are also few (if any) of the spouts on the kitchen faucets I have included that won’t swivel. The fact is you have to think about how much of a “swivel” you need. Is your sink located in the middle of your kitchen? In which case a spout that swivels 360 degrees could cause you problems. These are just a few thoughts I would like to pass on to you so you can make a properly informed decision on which type of faucet makes more sense for your kitchen. It’s not just about features, it’s about ease of use as well and I want to make sure you find a faucet that suits you and your kitchen down to the ground!